Unfortunately the "Cheapest Unlimited Mobile Plan Ever - Try It Free" offer is no longer available. 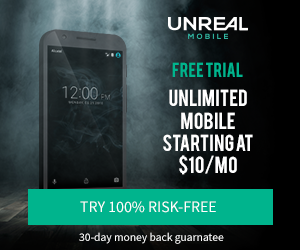 UNREAL Mobile has launched the cheapest mobile plan ever and the concept is simple. They want you to bring your own phone, and in return you can get an unlimited mobile plan starting at only $10 per month for 1GB LTE! Right now, click to get unlimited talk, text, and data + 3GB LTE (their $20/month plan) with this free 14-day trial. No overage charges. Once you use your high-speed data, speeds are only reduced to 2G speed. You can switch to Unlimited Mobile + 1GB LTE for $10/mo at anytime online under "Plan" in your account.